Dan Walton, a social service work student, found a sense of community at shows. In the vast suburban sprawl of Halton Region, finding constructive ways to focus the attention of teenagers can be difficult. Pocketed between the bright lights of Toronto and densely populated Hamilton, teens in Oakville and Burlington are left with few opportunities to socialize beyond their classroom walls. To combat the negative symptoms of teen boredom, organized sports are often touted as a means to prevent kids from getting involved with the “wrong crowd” or petty crime, but a city’s local music scene is rarely viewed as a vehicle to achieve the same things. In low-income areas, the affordability of live entertainment can be a big draw. 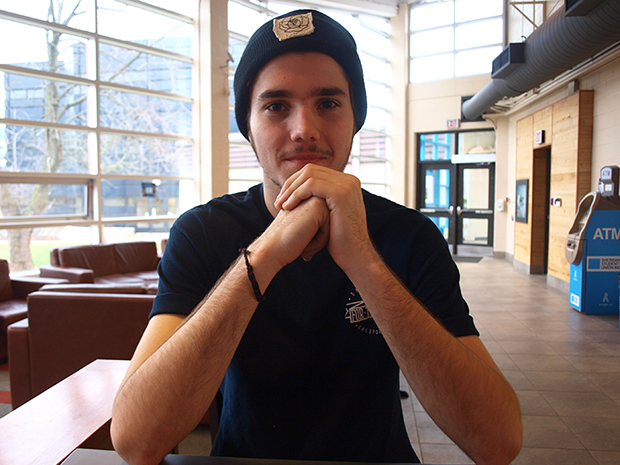 Cory Dobbin, a second-year marketing student at George Brown College, grew up in the Western Hill area of St. Catharines, and currently lives in Toronto. 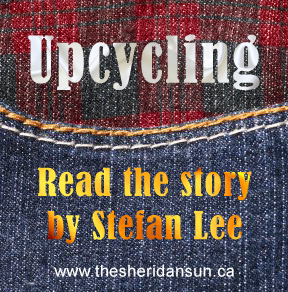 Dobbin said there’s a fair amount of trouble in that neighbourhood and the music scene was a great escape from that. “There wasn’t a whole lot of options for kids,” Dobbin, 22, said. Burlington’s Gillian Dorella-Scott, 31, works for PureGrainPromo and sees room for improvement in the number of community events held in Oakville. “We’re ‘burb kids. There’s not a lot to do here. There used to be.” Dorella-Scott grew up in an Oakville with community dances, shows, and even coffee house performances held in high schools. “I feel like the Oakville and Burlington community has shunned it. We have a perfectly good community centre, Velocity. No one uses it,” she said. Dan Walton, 19, first became involved in his local Burlington scene when he was 17. Walton was a basement guitarist, but after being exposed to the community, it inspired him to participate and start bands with his friends. It also provided a positive way to spend his spare time, avoiding the booze-heavy weekend parties that can dominate teenagers’ lives. Dorella-Scott, 31, has been promoting shows in Halton Region as well as Oshawa for 10 years. Her company hosted A Sight For Sewn Eyes and Fall City Fall at Club Absinthe in Hamilton in October of this year. Growing up in Oakville, she first became involved by going to shows when she was 13. At the time, Oakville’s YMCA held events every Friday. Dorella-Scott broke into promoting and found herself embodying a new role that would prepare her for parenting her daughter, Sophia. “The reason why I’m called ‘scene mom’ is because in every single scene I work, I’m a mom,” Dorella-Scott said. “I would be walking around after every show being like, ‘You getting home okay?’ I would not leave my show until every kid was cleared, in the car with their parents, or had a bus ticket home.” At times she would have her father pick her up from the venue, only to find her standing with three kids who needed a ride. Dorella-Scott watched a generation of show-goers and bands grow up and become more successful, some of which had gotten to a place where their videos were now aired on MuchMusic. Matt Bresee, 22, of Hamilton, began promoting when he was 15 in his hometown of Guelph. He runs Hit The Switch and works primarily out of Coco Cabana in St. Catharines and Bay City Music Hall in Hamilton. Bresee started attending shows when he was 13, and found the community spoke to an unsung type of teenager. “On a social level, I’m not saying that the music scene is made up (of) the outcasts and the rejects or anything to that effect. But for those who don’t play organized sports, there is a good medium in between people who are stars of the football team and the kids who sit in the basement and play Dungeons and Dragons,” he said. Bresee found the environment to be inspiring for youth. Added by Renée Lalonde on December 5, 2013.